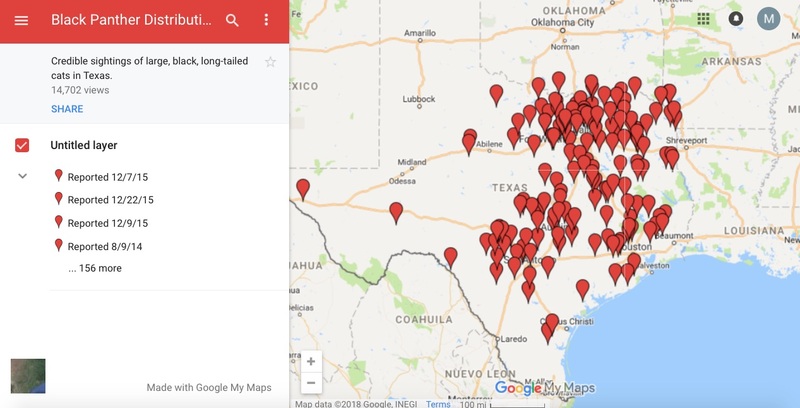 I have charted the latest round of black panther sightings in Texas and the updated black panther sightings distribution map is now ready for viewing. I will be the first to admit that sighting reports are strictly anecdotal in nature, unless they are accompanied by physical evidence or photos/video. Anecdotal evidence does not constitute proof that the black panthers of Texas and the American South are real flesh and blood creatures. To dismiss sighting reports outright, however, is folly. Many species have been "discovered" after biologists and explorers took the time to listen to indigenous people and follow up on the stories. The mountain gorilla and okapi are two good examples. I am hopeful that my efforts in documenting the sightings I deem credible will lead someone with greater resources to investigate this phenomenon and find out exactly what people are seeing out there. Just click here to go to the interactive map. Once at the site, you can click on any pin to get a brief description of what occurred there. Over the last half a year, or so, I have been busy working on getting my book, Shadow Cats: The Black Panthers of North America, finished out and published. I have spent so much time on it that the blog has suffered a bit. Now that I have completed the book and it has been published I am going to do my very best to get caught up on a back log of many things, not the least of which are new sightings of large, black, long-tailed cats in the Lone Star State. Below you will find the latest reports, a couple of which include video or a photograph shot by the witness. “I have a place about 6 miles southeast of Graham, Texas. In the past 20+, I’ve seen cougars and bobcats on the property and always enjoy getting to see their impact on the smaller critters and even found a good-sized buck that had been pulled into a tree by a cougar a few years back. In 2004, I walked up on a large black cat with a long tail that didn’t taper at the end, it was as thick at the end and rounded. I startled it as much as it surprised me and it quickly went down into a gully that it may have just come up out of when I came along. I was so shocked by its size and color that I actually followed down the large rocks (pretty stupid) until I realized that I was not being very bright. I told some TPW about the sighting, they looked at me as if I’d seen a pink panther and stated that no such animal comes that far north in Texas. When I told a local, who had originally thought me ‘crazy’ when I told him there was a cougar on the place, which was later verified, he immediately perked up and shared that a woman feeding her houses had seen something similar at dawn a few days earlier a few miles away. The animal was dark, I’d say black, but did have a pattern of lighter brown ‘honeycomb’ markings on its side and even tail. I set up a game camera but never got a photo and I have not seen a dark big cat since. Still get a cougar every few years and had several bobcats that came around but I think someone on surrounding properties killed them. People are afraid cats will kill their pets, goats, or calves and tend to kill them. TCH Comments: James, thank you for sharing your story. 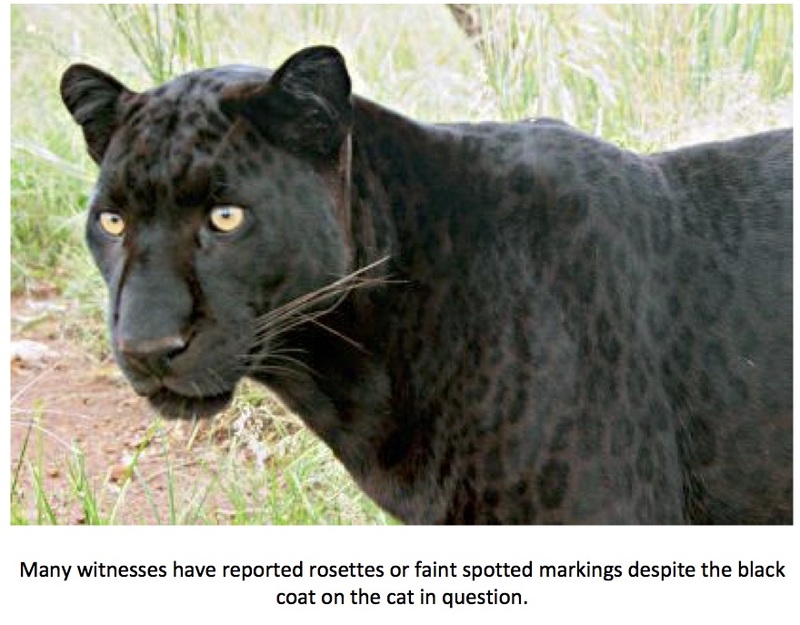 Based on the description, there are really only two animals James could have seen: a melanistic jaguar or leopard. Jaguars are, of course, native to Texas while leopards are Asiatic and/or African cats. Graham is in north central Texas to the west of Fort Worth in Young County. This is pretty lonesome country and there is plenty of room for a big cat of some kind to roam. There is a more than adequate prey-base in the region and water sources include Flatrock Creek, the Brazos River, Graham Lake, and Possum Kingdom Lake. The area is one from which cougar sightings are becoming more common (a huge male mountain lion was recently road-killed outside of Mineral Wells which is just to the southeast of Young County’s borders). “Hello! I discovered your blog while trying to validate sighting a black panther. I felt the need to add another sighting to your lists. We have property in Limestone county. Specifically, between Mart and Groesbeck. Last spring, March 2017, my Great Danes rushed out of the yard into our pasture after something towards the wooded creek. I was watching closely as we have had several young calves and yearlings go missing. Those of us in the area are aware we have a predator. My dogs are both over 130 lbs. but they went to the creek and into the woods along it. They promptly hightailed it back into the fence and me. I thought at first it must have been a false alarm but then saw a large black cat. Slowly, serenely walking along the edge of the woods. It walked across the gravel road and continued into the creek area. It was without a doubt a cat. Black with a long tail (the tail was nearly as long as the body of the cat). I would estimate the size of the cat to be about 75 lbs. roughly the size of a full-grown Labrador. Not as big as my Danes, but big enough to send my them scurrying away. That was my eye witness account. When I was speaking of it with one of my neighbors she told me that everybody knows that there are black panthers in the area. (We are fairly new to the area.) Her husband and a laborer got too close to one building a fence near their woods/creek line. She said they were putting in posts and heard a ‘little rumble’ they looked up and in a tree not 15 feet away was a black panther watching them. She said they commenced to backing away, yelling and waving their arms. The panther jumped about 10 feet out of the tree the other way and walked deeper in the woods. She just laughed and said they took a long lunch and came back with guns on their hips. But they didn’t see it again. Good luck to you in obtaining evidence!" 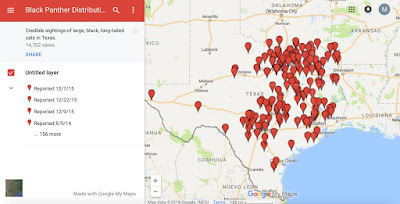 TCH Comments: Limestone County in central Texas and the counties that surround it have been the source of many black panther reports over the years. The area is rural and farming and ranching dominate economic activity. There are also large tracts of land owned by mining outfits that are off limits to the public. All in all, there is a lot of space for a big cat to roam. In addition, there is a healthy population of the usual Texas prey species (deer, hogs, rabbits, etc.). Kristi’s description of a solid black cat with a tail “nearly as long as the body” is consistent with most of the reports I receive. I can personally attest to the fact that many residents of Limestone County have no doubt that some kind of large, long-tailed cat roams the area. “I encountered what could only be described as a black panther on Wednesday morning 10/18/17 at around 6:15 a.m. in Euless,Texas. I was taking the dog out, leashed with her in the lead, and as we walked down the front steps she suddenly planted her feet and began to moonwalk backwards. I looked up and screamed because less the 7 ft. from us, was an ink black, powerfully built animal, I screamed and it glided across the driveway as we of course ran back into the house. An hour or so later, when the sun was up I went outside to look at the grass where it had crossed and it was bent sideways and smashed down quite deeply indicating the animal had to have had significant body weight. I am wondering due to the circumference of grassy area that has been disrupted if it had been crouching in that spot when my dog became aware of it. Yikes! TCH Comments: Euless is in Tarrant County just north of and between Fort Worth and Dallas. At first glance, this seems an unlikely part of the state to see any kind of big cat, but past experience shows me that simply is not the case. Tarrant County has been the source of no less than six (counting this one) black panther reports that I feel are credible. There have also been several reports of tawny-colored mountain lions in the county. Bobcats have become almost commonplace in the area. How are these cats finding their way into such an urban area? There are numerous small creeks that provide greenbelts which the cats could use as transportation routes. There are also golf courses and large parks that provide wooded areas. Perhaps the most intriguing idea is the possibility that some kind of big cat is living on, or near, the Dallas-Fort Worth International Airport. The airport occupies a very large piece of land in Tarrant County. The Dallas-Fort Worth area is heavily populated and urban but becomes rural very quickly on the northernmost edges of the Metroplex. There is no reason a stray cat could not find its way into more populated areas for at least a short amount of time. Another possibility is that predatory cats are learning to live in more urban areas. The theory of urban big cats is something I have been intrigued with for a while and is discussed in my book. TCH Comments: Alcatel-Lucent sits in the heart of Plano just north-northwest of Dallas. Most of the city sits in Collin County with a portion lying in Denton County. The area is urban and heavily populated; however, like Tarrant County to the west, it is a veritable hotbed of black panther sightings. Cougar and bobcat sightings have become much more common in the area as well. The sighting location sits next to a greenbelt that eventually connects to Prairie Creek to the west. This creek meanders about and connects to several tributaries that eventually lead to Lake Lavon to the northeast and Lake Ray Hubbard to the southeast. Interestingly, the Alcatel-Lucent location is only 5-6 miles to the east of the Arbor Hills Nature which has been at the center of several black panther reports over the last few years. It is an odd location for such a large predator to be seen to be sure; however, the urban big cat theory may come into play here as well. Time will tell, hopefully. Our 300-acre ranch backs up to the Sabine River east Of Greenville. It is surrounded by large farms with much wild wooded areas. We have seen 2 cougars in the last 5 years , both in the pasture and are sure they were not bobcats. Yesterday, my daughter heard something as she was walking down in the woods between the pecan orchard and the wilder area.. She looked and reported a cougar-like cat - large with a long tail - in a tree. She was near a group of wild hogs (we have hogs, deer, and a big herd of horses). We have had 2 injuries in the past 10 years of 1-2 year olds (horses) with large paw ripping marks down their sides... no other animal but big cat would do this. I’d love you to put a game camera up. We were given some smaller ones (2) and you can put them up as well . We can show you the area in a gator. It is pretty remote and wild. TCH Comments: Greenville sits in Hunt County about 25-30 miles east of Lake Lavon. The property where the sighting took place sits on the Cowleech Fork of the Sabine River. It covers 300 acres, much of it covered in native hardwoods. I took the owner up on her invitation and visited the property a bit over a month ago. I deployed two game cameras and was impressed with how wild and remote the property really was. If there were ever a place where a big cat – oe almost anything else – might be hiding in Texas, this could very well be the spot. After seeing the property and visiting with the family, I am convinced the sighting is credible. I am due to return to the property and check on the cameras in the next 3-4 weeks. I am excited not only by what images my cameras might have captured over the last month or so but by the long-term possibilities of what I might get a glimpse of if I am able to leave the cameras in place for a longer period of time. An update, hopefully with photos, should be upcoming in the next few weeks. “Shot this video (see below) yesterday in Stephens county Texas. Was trying to figure out what it was and came across your site. This is at least 40 yards with a crappy iPhone video. My guess is cat was 2.5 feet long plus a 2-foot tail. At least 35 lbs. My guess is closer to 45-50. The grass in the video is easy knee high. TCH Comments: The video is interesting to be sure. As is the case most of the time, there is little in the video to provide us with a firm idea of scale. The grass does seem pretty tall. IF we speculate the grass is 18-inches high (approximately knee high for most adults) then the cat could be very large. As I’ve looked more closely at the video, it seems the cat is actually making its way across an area where the grass is low or bent down (the taller grass appears to be in front of and behind the cat); perhaps a trail? You can see too much of the cat’s body for it to actually be in the middle of the tall grass. Too, I find the head of the cat interesting. It is very reminiscent of the head of a domestic/feral. I think there is a distinct possibility that is what we are seeing in the video: a domestic/feral cat. That theory does NOT mean I do not believe the witness’s estimation of size and weight (2-feet high and 35-50 lbs.). This is exactly the sort of cat-like animals being reported in Australia on a regular basis – a continent that has no native species of cat. The prevailing theory there is that feral cats are growing to exceptionally large sizes – some the size of small leopards. If it is occurring in Australia there is no reason to think it could not be happening here as well. 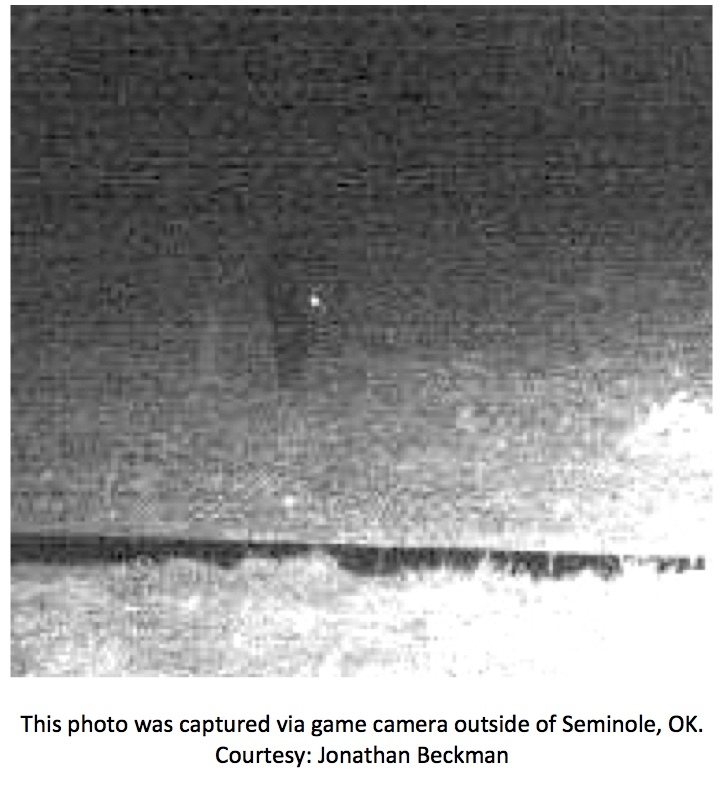 “Found your web page Googling for possible panther sightings in Oklahoma. I caught this interesting photo (see below) on my game camera early this morning and thought I'd share it. If you'll look to the left side of the image, there is some kind of slender black animal walking toward the camera, seemingly looking off slightly to the right side of the photo (only one eye reflection visible). It looks like the front left leg is obscured by the front right leg. I've shown it to several friends, and we can only guess what it might be. I get pictures of hogs, deer, bobcats, etc., but haven't ever caught something like this. I'm just west of Seminole, Oklahoma. I put out some tuna out there to hopefully lure it back tonight (lol). Any guess at what it might be? TCH Comments: Thanks for taking the time to send the email and the photo. I've lightened the photo up and zoomed in but it gets pretty blurry and pixelated when I do. I'm really not sure what animal we might be looking at here. It could be a cat of some kind but it is just impossible to say for sure. Your idea of baiting out the spot is a good one. I would also set your camera to take multiple shots when triggered (if this is an option). If you can get multiple shots of a target it makes it easier to determine what it is. Please let me know if you get anything else photographed. Good luck. TCH Comments: The area in question sits right at the point where Frio County and Medina County meet. The region is what would be considered the southernmost part of the Texas Hill Country. This area has been the source of multiple reports of large, long-tailed, black cats in the past. The witness compared the size of the cat seen to that of her Texas Heeler. As the name implies, the Texas Heeler is a working dog found most commonly in the Lone Star State. It is usually a cross between an Australian Shepherd and an Australian Cattle Dog. They are medium-sized dogs that weight between 25-50 lbs. and stand roughly 18-24 inches tall. The witness describes a cat significantly larger than her dog. This fact, along with the long tail described, effectively eliminates the bobcat as a culprit. The yellow/green eyes are a characteristic that I have heard described on multiple occasions. The area is rural and lightly populated. It holds an abundance of rabbit, deer, hogs, and other potential prey-species. While fairly arid, there are rivers running through the area. A big cat sighting here is not surprising; only the color described is a head scratcher. “I saw your blog just now and would like to add my experience. TCH Comments: Crandall, Texas actually sits in Kaufman County. Kaufman County gives way to Dallas County west of Crandall (near Seagoville). Based on the description of the area given, it seems more likely that Kaufman County was the actual location of the sighting (both counties have been the source of black panther reports in the past). Regardless, the witness is adamant that what he saw was a cat far too large to be a domestic/feral. If she really did get to within 15-20 feet of the cat, she got a pretty good look and her belief the cat was extremely large should not be discounted. TCH Comments: Sutton County sits in southwest Texas between the towns of Junction and Ozona and is bisected by Interstate 10. It is big country and sparsely populated. As of the 2010 census only 4,128 people lived in the 1,454 square-mile county. That works out to only about three people per square mile. Mountain lions do inhabit the area and the county is less than 100 miles north of the Mexican border. This proximity to Mexico makes a melanistic jaguar a possibility in this case. I will not be placing this report on my sightings distribution map. I have no reason to doubt the witness but the fact that it was dark and there is little detail as to how far away the cat was, how powerful a spot light was being used, etc. leaves too much room for misidentification. TCH Comments: Coldspring is in east Texas and abuts the Sam Houston National Forest. It is an area from which black panther reports have come in the past. Even so, I will be leaving this report off my sightings distribution map. The witness claims to have seen the cat in “the middle of the day” but later says the time was “11:00 p.m.” This could be a simple typo but the discrepancy as written is too big to ignore. TCH Comments: As odd as this location seems to be, I cannot ignore it. I have now had multiple witnesses claim to have seen large black cats in the park area in the immediate vicinity of the San Antonio Zoo. I do not feel that whatever is being seen is some sort of escapee from the zoo (that assumption seems intellectually lazy, in my opinion). That being said, I do not know what a cat 2 feet-high and 4 feet-long would be doing in this area. Could the zoo be involved in another way? Could some sort of cat be attracted to the scents emanating from the animals exhibited there? The zoo is in a heavily populated and urban area but there are a series of parks and golf courses (San Antonio Country Club, Olmos Park, the Quarry Golf Course) with creeks and greenbelts that extend back to the north all the way to the San Antonio International Airport. Just north and east of the airport another series of parks (McAllister Park, Lorrence Park, and Mud creek Park) create a green belt that, while not quite contiguous, reach almost to the outer loop (1604) of the city. Things get very wild and lonesome pretty quick once north and west of the outer loop. Admittedly, it is a stretch to think that a large predator would come this far into a major metropolitan area, but there is some evidence that suggests leopards in India are doing this very thing. Not only are they surviving in cities, they are thriving there. Could it be happening here, too? TCH Comments: This would really be something if it could be confirmed. Gail sits in Borden County south of Lubbock in some pretty lonesome country. The occasional cougar is seen in this area but a jaguar would be huge news. If possible, I would like this witness to contact me. I have some additional questions I would like to ask. TCH Comments: Lake Ray Roberts is located north of Dallas/Fort Worth and not too far south of the Red River which forms a large part of the Texas/Oklahoma border. I am not surprised at all to hear of a mountain lion in this area. I will not include this sighting on my distribution map as it was a tawny lion that was spotted but felt it was important to point out that large cats are being seen in the area. This could provide clues as to the identity of the black panthers of Texas. TCH Comments:. Lindale is in east Texas just to the north of Tyler. As is the case in most of the eastern portion of the state, the area bordering Lindale is wooded, has plenty of water resources, and is a wildlife haven. Reports of big cats of different sizes and color have come from this area in the past. The description of a brown cat with spotted markings standing 3-feet high is telling. On a side note, we all need to try to keep in mind that predators take other animals. It is how they survive. They are not evil. They are just doing what they were made to do. As humans continue to encroach on their habitat, it is an unfortunate certainty that incidents like the one described by Holly will occur. The lack of blood can most likely be explained by settling. Once blood pressure is lost, blood stops flowing. It will settle to the ground side of the carcass and coagulate there inside the body. It is not unusual to see a kill without much blood on the ground. TCH Comments: I am not surprised by the mountain lion sighting. Cougars have been reported on a semi-regular basis in the Texas Hill Country over the last few years. The jaguarondi sighting, however, would be big news as the Burnet area is far north of the accepted range of the species. The sighting area is just north of a pretty substantial protected area called the Balcones Canyonlands National Wildlife Refuge. Formed in 1992, the refuge was intended to preserve the endangered golden-cheeked warbler and black-capped vireo and to provide habitat for numerous other Hill Country wildlife species. Only 3,000 of the refuge’s 27,500 acres are open to the public. That being the case, there is plenty of room for a species of predatory cat to roam. “Hi there – I saw your blog and wanted to report a sighting from this past weekend. My dogs are fenced and were going crazy early (4:30-5:00am) on Friday morning (3/30/2018). When my husband went out on the back porch to check on them he saw 2 black panthers on the immediate outside of our iron fence. When they saw him, they ran but they certainly were not afraid of our barking dogs. They were definitely black, with long tails. They were as big or a bit bigger than my dogs who are both 85-90 pounds. We are at the edge of Rockwall county and Collin County on highway 205. 3 or so years ago one ran in front of my car on 205 and crossed into the bottoms between Lake Lavon and Lake Ray Hubbard. I called the Corp of Engineers to tell them what I saw because I knew it was not a bobcat. They told me they knew of a black panther in that area at the time because they had seen paw prints. About a year ago a mountain lion jumped out of one of our trees in our yard and killed a rabbit while we were on the back porch watching the whole thing. I feel so sad for these animals with developments running them out of their territories. They really haven nowhere to go. TCH Comments: The Collin County/Lake Ray Hubbard area continues to be the source of numerous black panther reports. 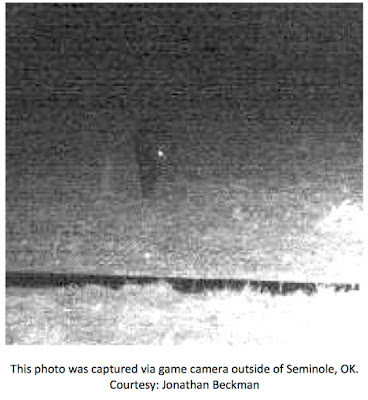 The area of this sighting is northeast of Dallas. While urban sprawl has swallowed up many areas that used to be very rural, this is the region where the “city” ends and the “country” begins. I have a couple of game cameras up not too far to the east of this sighting location (outside of Greenville). TCH Comments: New Summerfield sits in Cherokee County south of Tyler (not to be confused with Summerfield, Texas in the Panhandle). 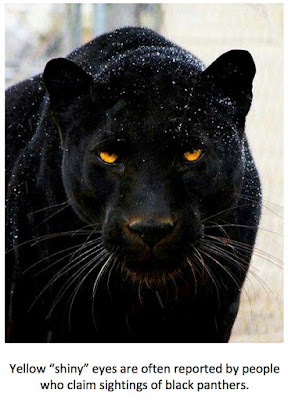 As mentioned previously, the greater Tyler area has been the origin of many black panther – and other big cat – reports. I am going to hold off on adding this sighting to my distribution map as it is second-hand in nature. I have no reason to doubt Terry but would like to hear from her husband as he is the actual witness before adding the sighting to the map. I will be updating my black panther sightings distribution map within the next day or two. I have now amassed over 150 total sightings of large, black, panther-like animals that I feel are credible. In addition, I will be checking on my game cameras outside of Greenville, Texas within the next month. These cameras are in an absolutely amazing area along the banks of the Sabine River. I have high hopes that they will capture something of interest over time. Please continue to email sighting reports to me at the following address: Texascryptidhunter@yahoo.com. It is very important that you email if you are hoping to hear back from me. I cannot reply directly to you if you leave a report as a comment on another post. 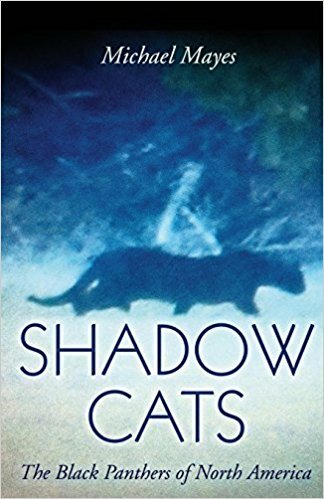 If you would like to read more about the black panther phenomenon, please pick up a copy of my book, Shadow Cats: The Black Panthers of North America. It is available on the Amazon and Barnes & Noble sites. I would very much appreciate it. One thing I have always been interested in when it comes to the sasquatch/wood ape phenomenon is historical newspaper accounts of “wild men.” The accounts I am most interested in all occurred years – often decades – before Roger Patterson and Bob Gimlin filmed what might very well have been a living breathing sasquatch at Bluff Creek, California or Jerry Crew found huge footprints surrounding his bulldozer near Willow Creek (an event which was heavily publicized and thought by many to be the moment bigfoot was “born”). 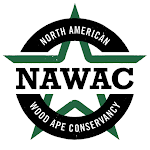 NAWAC Chairman Alton Higgins brought the following historical report to my attention today. “We learn that between Sobby and Crainsville on what is called Piney, in McNairy County, TN a strange and frightful being has been observed for several weeks. He is said to be seven feet high and possessed of great muscular power. His eyes are unusually large and fiery red; his hair hangs in a tangle and matted mass below his waist, and his beard reaches to below his middle. His entire body is covered with hair and his whole aspect is most frightful. He shuns the sight of them but approaches with wild and horrid screams of delight every woman who is unaccompanied by a man. As is often the case, there is little to nothing in the way of a follow-up to this article. What happened to the Wildman of McNairy County, Tennessee I cannot say. The most likely answer is nothing. My guesswould be that the sightings and encounters ended as suddenly as they began. The likely explanationforthis is that the creature/Wildman moved on to other less populated areas. What fascinates me most about these old accounts are the descriptions given of physical appearance and/or behaviors observed. The descriptions seem to match up very well when compared to what has been described by modern sasquatch/wood ape witnesses. In this short article alone there are numerous examples of this. Notice anything familiar? The observations/descriptions from this 1871 article are things commonly reported today by modern sasquatch/wood ape witnesses. Not all contemporary witnesses describe everything mentioned above, but it is a safe bet that modern sightings feature many of these same details. I realize that many of you out there who are interested in the bigfoot phenomenon already know about a lot of the historical reports out there (many of which are detailed in Chad Arment’s book The Historical Bigfoot). There is no new news here for many of you. Many, however, are unaware of just how many similar articles appeared in newspapers in the mid to late 1800’s and into the early 1900’s; a time long before the term bigfoot was popularized. 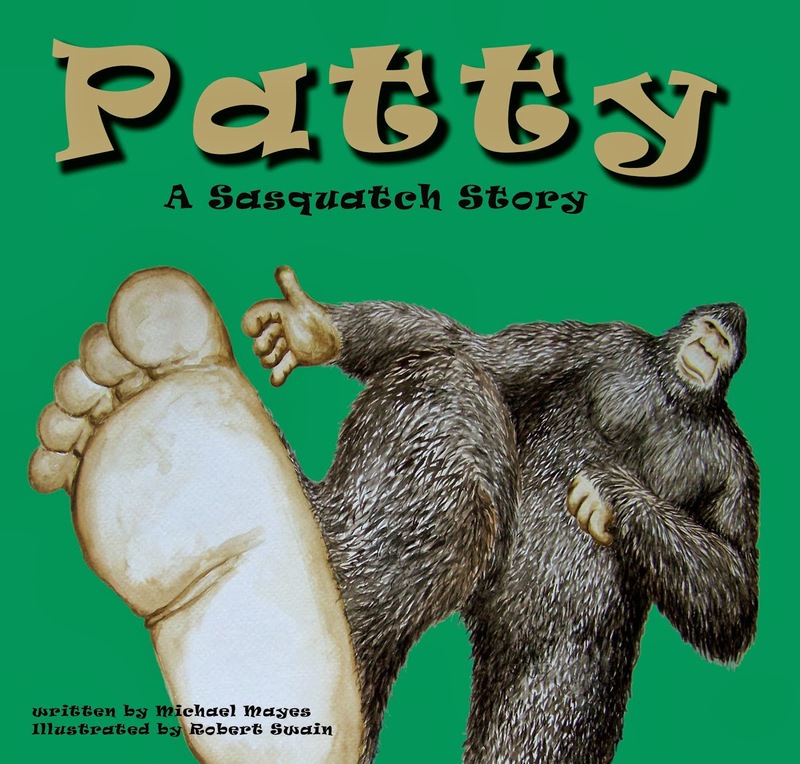 The fact is one of the things that convinced me years ago that there was something to this whole sasquatch mystery. For those interested in historical Wildman accounts, the Chad Arment book mentioned above is a great place to start. 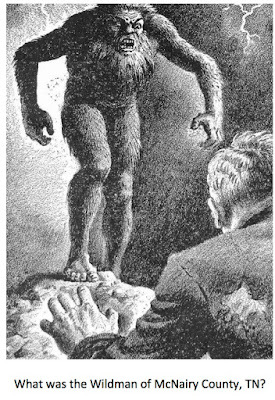 If nothing else, these old articles prove that tales of huge, hairy, upright man-like creatures go much farther back than the 1950’s-1960’s. McClean Scott. "The Tennessee Wild Man...1871." Bigfoot Encounters, www.bigfootencoutners.com/articles/mcnairyTN.htm.